Beginning a home search is very exciting. Often times, it begins by simply “window shopping”. However, at some point, the search begins to get a little more serious and focused. When that happens, you will begin to look for homes for sale online more frequently and start to focus on specific areas, price ranges, etc. So, how does searching by “days on market” help? Once you have looked over the same list tirelessly, you may want to just focus on homes that have come on the market within the last 5 days or week or even yesterday. 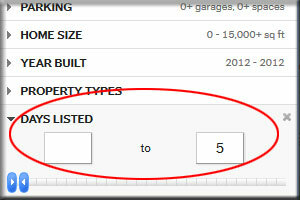 Optional: Save the search (for example, “Properties Listed this Week”) by clicking ‘Save this Search’. You can access the search by clicking on ‘Searches’.